Are you ready to take your mouth on a little journey of deliciousness? 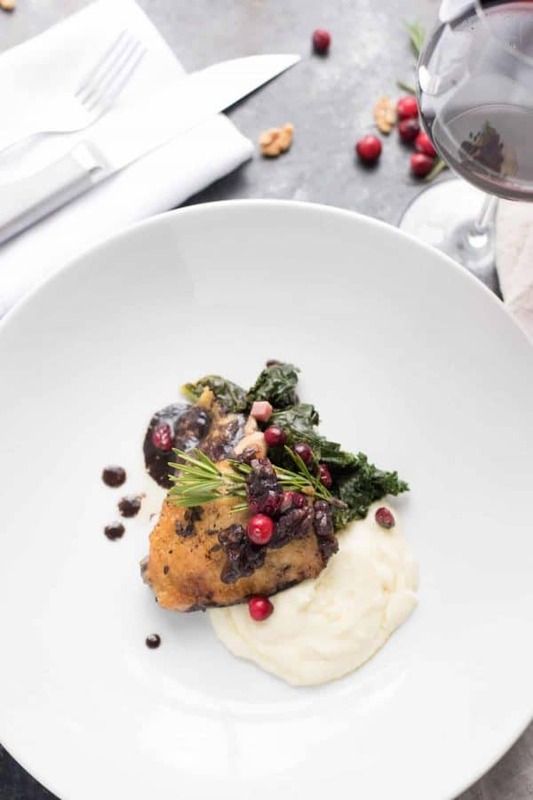 Golden brown skin, pleasantly crispy, a hint of salt with fresh herbs scattered throughout, giving way to steaming, tender chicken infused with flavors of red wine, tart cranberries and bright balsamic acidity with the richness of chicken stock and a touch of butter to even it out. 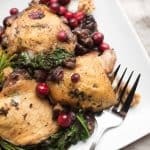 These Cranberry Walnut Chicken Thighs are a cold weather classic dish that will make your mouth very happy. You know it’s time to break out your fall weather cooking and baking feels when one thing in particular happens. Yes, the changing of the season helps. Visually, the leaves turn brilliant colors of red, yellow and orange, and the crisp fall air makes the world smell of autumn. But no, that’s not what I’m talking about – especially with this year and the mid 70° days we’ve been having here in Boston. It’s officially time to put on your fall flavor thinking cap when you walk into the market and they’re right there. Calling your name from the other side of automatic doors. Bright red and maroon round faces staring at you from a display promptly at the front of the produce department. Crisp, tart and tangy. It’s here. It’s cranberry season in New England. 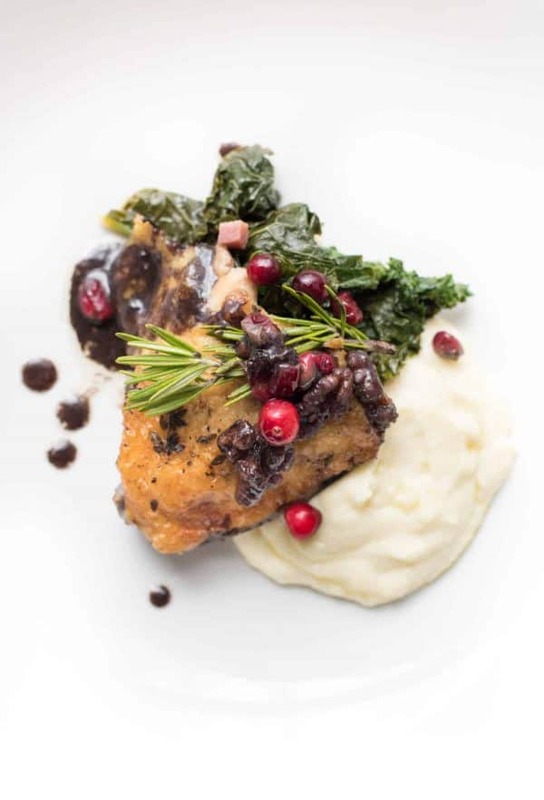 Let’s not disappoint our small, snappy and rotund Cape Cod fruits, let’s make Cranberry Walnut Chicken Thighs. Apologies in advance for repetition, but being from and living in New England is one of my favorite things. Historical places are literally around every corner, not to mention the beautiful scenery…but really, the food is where it’s at. When it comes to fall weather foods, there is no exception. Cranberries grown just an hour drive from the city center. So let’s grab some of these fresh New England berries and simmer them in a rich, red wine sauce to serve up in these with one of the most underrated cuts of chicken. Chicken thighs are typically inexpensive and easy to find. For this dish in particular, you’ll want the bone-in and skin-on. In my opinion, I find them to be the most looked over cut of the chicken. Perhaps it’s the skin or that the bone requires just a touch longer for cooking. 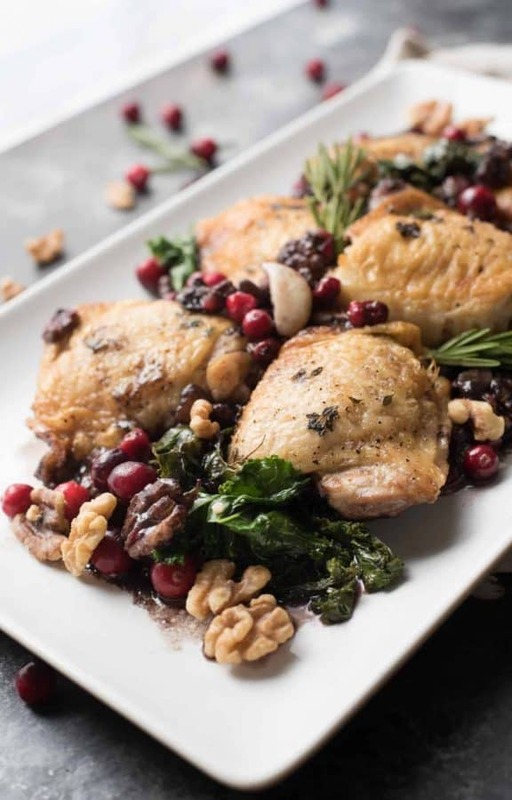 But for the cost, these Cranberry Walnut Chicken Thighs are seriously going to delight your taste buds in texture and taste. 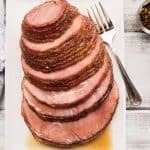 A perfect alternative for those who are not big turkey fans or if you’re having a smaller style Thanksgiving Dinner, this dish is far easier than roasting a whole turkey and packs all sorts of tantalizing tastes. And of course, not running the risk of a ‘Christmas Vacation’ style overcooked turkey is always a bonus. Very forgiving, because there is additional fat from the bone and the skin, as well as the additional liquid from the sauce, if you do cook these chicken thighs a touch too long, they will still end up moist, tender with delightfully crispy skin. A win for the chef and a win for the guests! 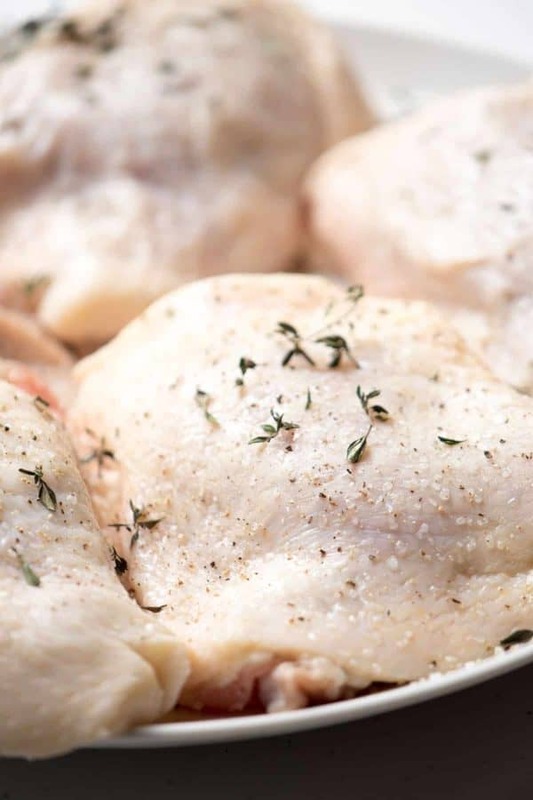 Be sure to pat the chicken thighs dry before seasoning and that your pan and oil are both hot, this will make sure your skin will braise nice and golden brown. Once this step is down, you’ll just need a few more ingredients to throw into the pan and we can call it a day. Might as well pour a glass of wine and start relaxing now, right? Favorite things about this sauce, hmmm. Besides the cranberries, all the ingredients are pretty common fridge and pantry staples. It has bright acidity from the wine and vinegar, bursts of tart flavor from the cranberries with a rich crunch from the walnuts. Yes, that part of it…. 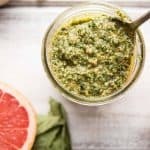 The number 1 favorite thing about this sauce? Throwing ingredients in a pan and letting it come together on it’s own while the chicken bakes away adding additional flavor. Yep, that’s it, that’s the one. After braising the chicken thighs, you’ll want to carefully remove about half the fat from the pan. If you have confidence abound, you can drain it from the pan. But me personally? Not that coordinated. My high recommendation is to remove the braised chicken thighs to a plate and drain the fat into a bowl, letting it cool down before discarding it (or saving it for some other treat like homemade French fries). From there, add the chicken thighs back to your pan and begin building your sauce over medium heat. 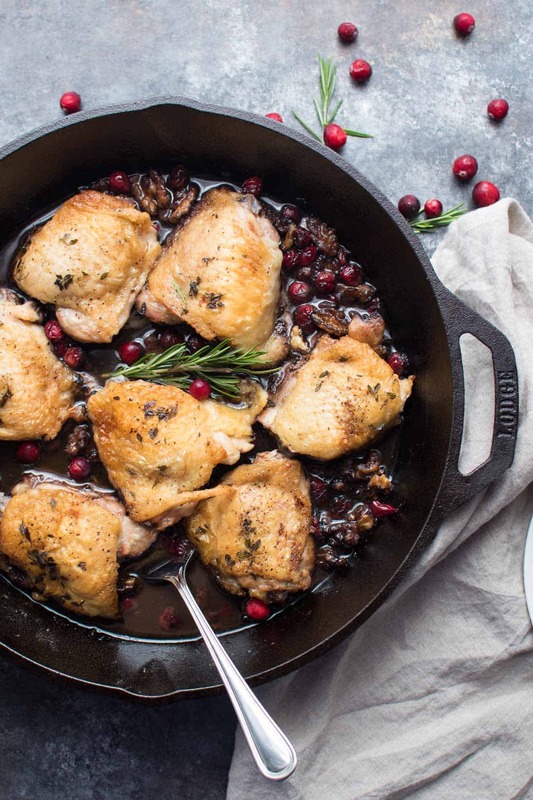 The red wine will simmer, deglazing the pan – which is really just a fancy way of saying it’s going to get all the good fatty protein deliciousness that stuck to the bottom of the pan and incorporate it into the sauce. 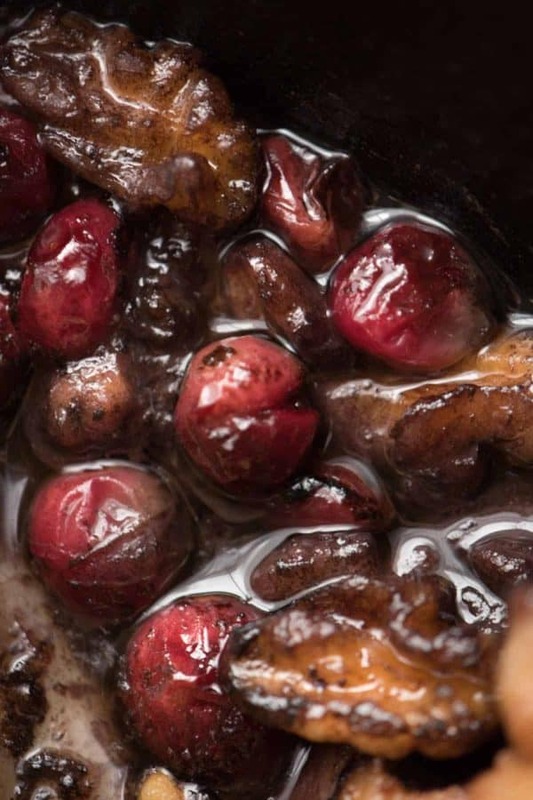 Add your remaining sauce ingredients and sprinkle in the cranberries, garlic and walnuts. Let’s put these bad Larry’s in the oven and think about more important things, like sides, dessert and what wine we will pair with it. Side dishes are an important piece to the main event. These Dreamy Creamy Puréed Parsnips are one of my favorite things to serve up with Cranberry Walnut Chicken Thighs. Creamy, slightly starchy and subtle sweetness of this cold weather root vegetable is in perfect contrast to the tart, crispy chicken. Besides, it’s real easy to make so that’s always a no brainer decision. 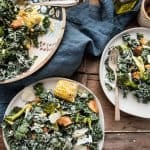 Other side dish favorites include the Best Ever Braised Kale, as seen dished out in the photo above. Maybe kale isn’t your thing. If you want to bring a little bite of heavenly goodness to your side dish game, you need this Rainbow Chard and Shallot Gratin. A little more effort than puréed parsnips, but man oh man, cheesy rich veggies fah days kid. And it’s leafy green veggies, so that makes it healthy right? 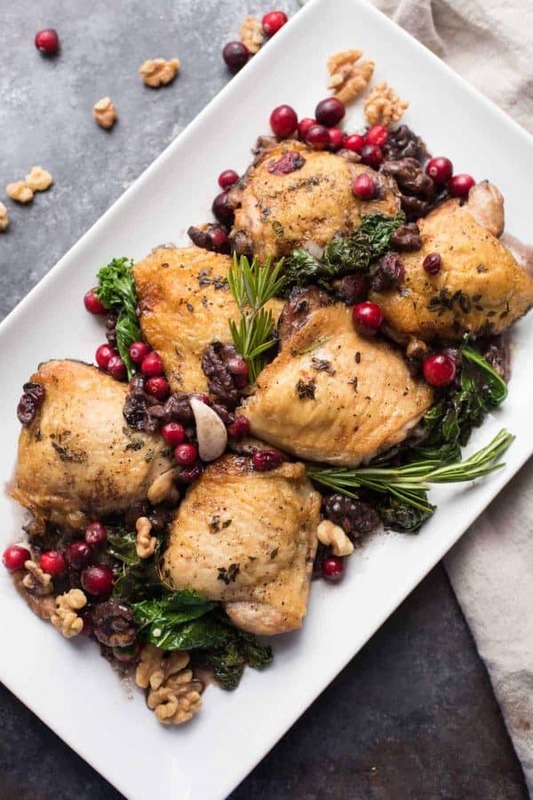 Pair your Cranberry Walnut Chicken Thighs with whatever makes you stress free and happy. Tuck in and enjoy this New England inspired, fancy looking, easy to accomplish dinner! Stuck around this long? Here’s a bonus, behind the scenes, toddler tasting photo bomb. 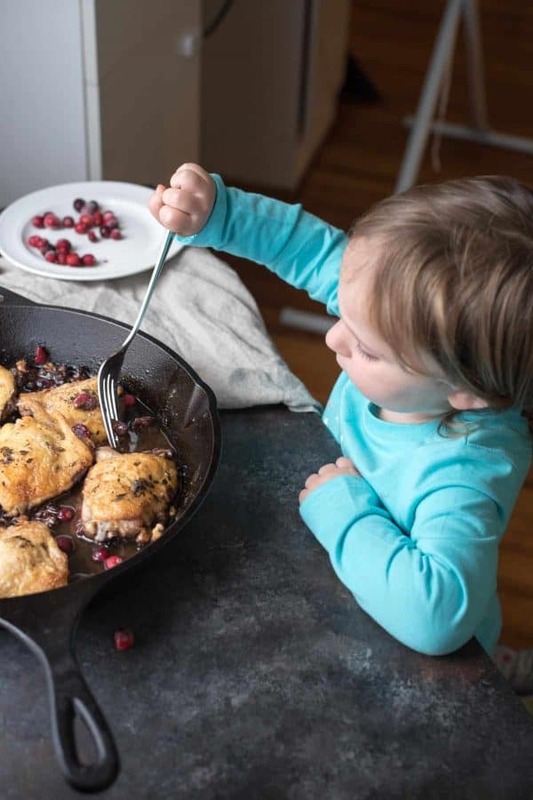 These Cranberry Walnut Chicken Thighs are toddler approved! 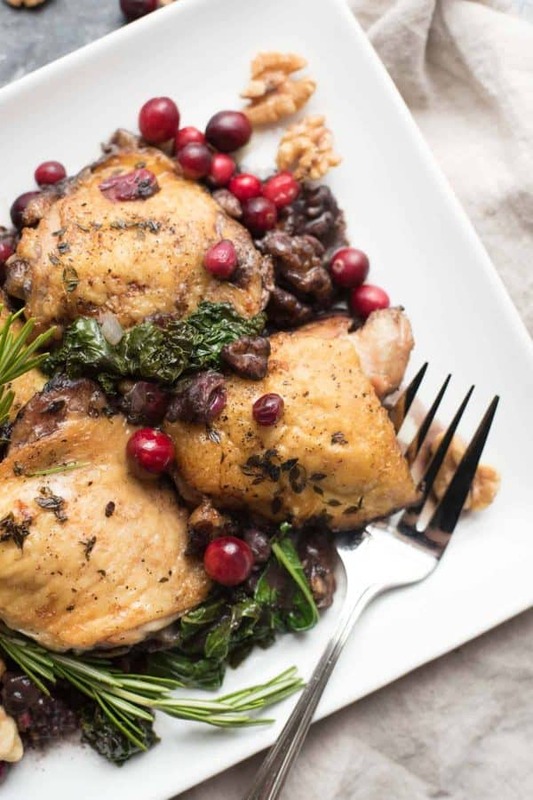 Tender juicy chicken thighs braised with herbs and spices for delightfully crispy skin and simmered with red wine, walnuts, fresh cranberries and herbs for a rich, tart sauce perfect for the holidays. Preheat oven to 375°F. Remove the chicken thighs from package and pat dry with paper towels. Season both sides of the chicken with salt and pepper, resting on the plate skin side up. Sprinkle with fresh thyme leaves. Heat olive oil in a deep sided, oven safe sauté pan or cast iron skillet over high heat. Once oil is shiny and hot, braise the chicken thighs skin side down until skin is golden brown and crispy, about 8 to 10 minutes. Turn thighs over and let braise on the other side for 2 minutes. Remove the pan from heat. Transfer chicken thighs to a plate momentarily. Carefully remove about ½ of the grease from the pan and transfer the thighs back to the pan, skin side up. 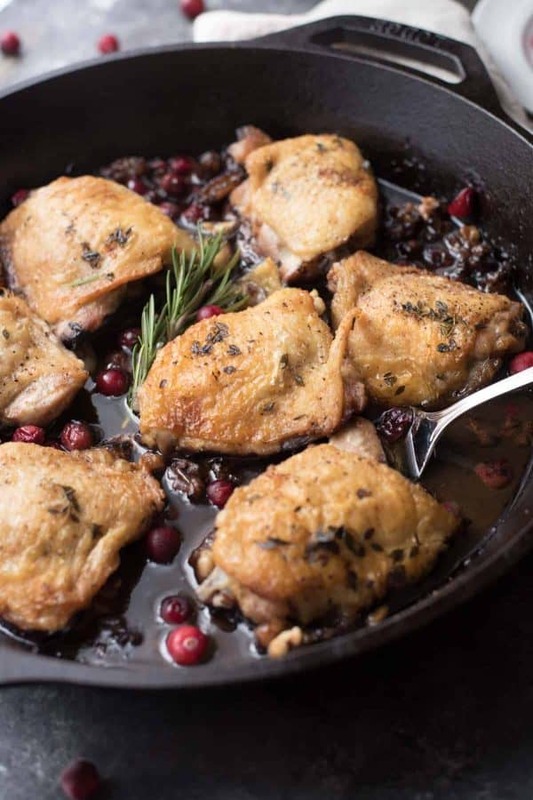 Turn the pan to medium heat and deglaze the pan with red wine. Add the balsamic vinegar, chicken stock, unsalted butter to the sauce. 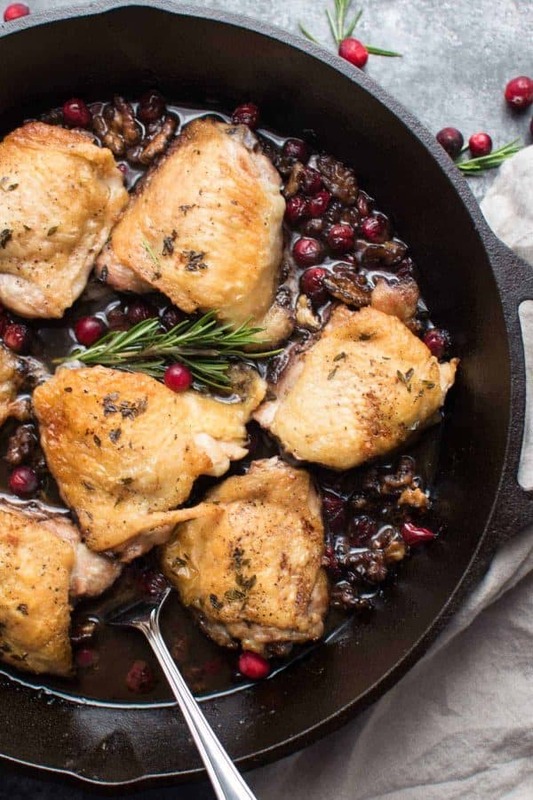 Sprinkle walnuts, cranberries, and garlic around the pan between the chicken thighs. Place the pan in the oven and finish cooking at 375°F for 20 to 25 minutes. After cooking the sauce may still have a layer of oil/fat from the continued cooking process. To remove this fat, remove the chicken thighs from the pan and lightly place a piece of bread on top of the sauce. Flip over and place over another part of the pan. Repeat until the bread begins to soak up the sauce. If you prefer a thicker, gravy style sauce: stir 2 teaspoons of corn starch into 1 to 1 1/2 tablespoons water. With the sauce simmering on low heat, slowly stir in the cornstarch mixture and whisk together for 1 to 2 minutes until it begins to thicken. 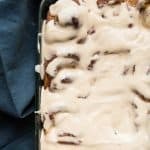 You had me at cranberry walnut! Love this time of year! I agree! I love this time of year! Holy yum! This looks AMAZING. What a perfect dish for the holidays! Oh my gosh! That looks really good! This is perfect for the holidays! I will absolutely try this! Oh. My. Gosh. 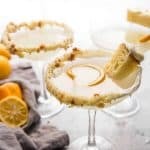 This is the new recipe I’ve been looking for – this is perfect for this time of year, too! This looks delicious and perfect for Thanksgiving! this looks so fantastic, and beautiful!! i saved on pinterest and followed you as well! This looks so yummy! I’ll have to try this!